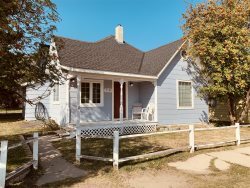 This Red Lodge home situated on Red Lodge Country Club Estates and Pine Ridge gets better and better from the moment you arrive to the moment you walk into the home. The view will make you forget about unpacking and have you opening up one of the two sets of sliding glass doors to the patios and hot tub…yes this is the Red Lodge Life! You overlook the town of Red Lodge and the golf course with Red Lodge Mountain, the Beartooth Range, Mount Maurice and the Pryors in the back ground. From your patio to the East you can soak in your jet pack hot tub with waterfall and watch the moon come up. If you are an early riser and love to watch the sun come up it is not a bad view either. Of course the decision on what to do will be difficult as your covered patio on the West will give you an incredible sunset…not to worry the patio facing south will catch ALL these events without you ever having to adjust your chair. Your home has been thoughtfully and tastefully decorated by the owner. On your vacation, no matter how brief, you will experience a bit of luxury that you can enjoy with your friends and family. The owner has fully equipped your kitchen with most of what one could need (if it’s not there let us know and we will do our best to provide it for you). More importantly the design of the home gives you a wide open concept to enjoy each other. Cooking is a pleasure with granite counter tops, stainless appliances and center bar island. If you prefer, there is a gas grill and a Traeger smoker. If cooking is not your thing then curl up in one of the soft leather chairs next to the gas fireplace and take in the views. When night time arrives go relax outside around the gas fire pit and enjoy the utterly spectacular star gazing. The three bedrooms on the main floor consist of a master with a king bed and full bath and a luxuriating Jacuzzi tub with a separate glass and tile shower, the second bedroom has a king bed and en-suite full bath. The third bedroom also has a king bed with a 3/4 bath across the way. Let’s talk about the bonus room…. or shall we call it the fun room? There are two bunks with each having a full bed on the bottom and a twin on top. If more sleeping is needed there is also a queen futon. Let the fun begin with a foosball table, games, books, smart TV, game table and a clear view of Red Lodge Mountain and the Beartooth Range. The attached two car garage is long enough for the big pickup and we encourage you to park in it. The side door leads to the laundry area and down the hall to the great room. In the garage is a Bob jogging walker if you need to stretch your legs with your little one...there is a nice paved path that goes along the golf course. Red Lodge will offer you many outdoor activities from snowshoeing, cross country and downhill skiing, fishing, hiking, biking, riding, shopping, eating and so much more. After a day of activities one surely will need a place to rest. The owner of this home not only wants you to enjoy your stay but also understands how important it is to just relax…whether it be sitting by the fireplace with a good book and a glass of beverage, soaking in the hot tub, chatting around the kitchen island, hanging out with the kids (or knowing they are enjoying themselves just feet away)…renewing oneself. It is our goal, along with the owner, to help make sure your time spent here is just that…a vacation. This property was wonderful! It was the ideal place for a winter getaway. We enjoyed the layout of the house, especially the upstairs room for the kids, as well as the fireplace, the Traeger, the hot tub (surrounded by snow) and the open plan living area. The bedrooms were also very comfortable. Heather and her crew were helpful and accommodated all our needs. We will return! "Stayed here with our daughters and grandsons during a recent ski trip to Red Lodge. The house was spotless, the beds were great and it had the best equipped kitchen we have ever seen. The large living room with gas fireplace has plenty of comfortable seating for a large group and theres a huge selection of games in the upstairs game room/bunk bed room. The oversized two car garage came in handy during the extreme cold and heavy snows that hit the area during our stay. A great hot tub is located on the patio overlooking the valley with a large quantity of quality bath towels provided. The overall design and layout of the home is top notch and the views of the valley and mountain range are amazing. We were very impressed with the home having a zoned heating system and on-demand hot water heaters to provide unlimited hot water for bathing/showering. This home is first class all the way!" Our visit to Montana and Yellowstone Park was the highlight of our month-long trip to your country. We stayed in 4 places on our journey and your home was by far the best! The pictures did not do justice to the quality of your home. Not only were the beds so so comfortable but we all noticed that 12 people showering, we did not run out of hot water and snooped at your set up and saw you really do care about your guests as you installed 2 Renai water heaters!! That impressed us but was only a start. My wife could not get over the comfort of your bedding. The house was spotless, and everything we could have needed to cook with was at our disposal. We even tried the Traeger and now need one. We took a couple gorgeous hikes (thanks for the trail book) and the hot tub delivered in a huge way with our achy bodies The views from your home are second to none. I really liked that your home is not on some back dirt road but still in a secluded area close to town. Our stay with you was very satisfying. What a great Montana home! Thanks so much for sharing with us. Very nice, clean, spacious home with fantastic views! Your home was like a heavenly dream! First class all the way! The open, soaring great room with the beautiful fireplace was so inviting and the many windows added that feeling of being outside all the time! The views from your home are amazing....from the mountains to overlooking the town to seeing a mother bear and her baby cubs wandering across the yard next door to you! We loved EVERY moment of it! Your beautiful home had every need and more that we could have wanted! The location of your home was perfect for us! We were so close to the entrance of Yellowstone National Park. We were able to enter Yellowstone, easily, from two of its entrances. We loved the town of Red Lodge and also, visited Cody, Wyoming as it was only one hour from your home. The location only added to our experience!